Depending on who you talk to, the phrase “Black Lives Matter” can be extremely controversial. To some, the sentiment smacks of some kind of perceived racial entitlement. To others, it’s a slogan designed to call attention to issues that reside at the intersection of American history, race relations, and policing models. 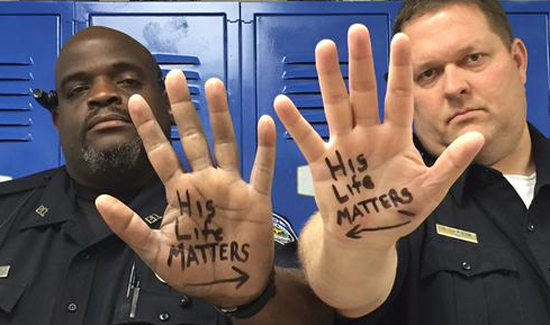 Two Texas cops, one of whom is a chief, recently posted a photo of themselves on social media, having written “His Life Matters” on their palms in ink, with arrows pointing to each other. The photo has since gone viral, and the reaction to the post is as diverse as America herself. What’s your reaction? Sound off in the Comments section below. I think the “ALL lives matter” is much more appropriate. And this includes the lives of cops and all others communities depend on as the front line of defense against crime. Controversy, important as it is, should not take away from the need to cooperate with law enforcement as much as possible.